The Phillies and Royals had both won their respective division titles from 1976 to 1978, but both also failed to advance to the World Series in any of those three seasons, and both then missed out on postseason play in 1979. In 1980, though, both Philadelphia and Kansas City reached the World Series. For the Royals, it was the first time in their 12-season history, and for the Phillies it was their first time since 1950. The Series opened in Philadelphia, but K.C. scored twice in the third to take a 4-0 lead. The Phillies came back with five runs in the bottom of the third, and scored another in the fourth to knock out Royals starter Dennis Leonard. The Royals didn't score again until the eighth, when Willie Aikens hit his second two-run homer of the game, and Philly held on for a 7-6 victory. Game 2 was another comeback win for the Phils, as they scored four runs in the eighth off K.C. relief ace Dan Quisenberry and captured a 6-4 decision. Back home for Game 3, the Royals grabbed a 1-0 lead in the first inning on George Brett's solo home run. With each club scoring single runs in three innings apiece, it was 3-3 after nine innings. And with two outs in the bottom of the 10th, Aikens drove a pitch to the gap in left center field, scoring Willie Wilson with the winning run. The Royals evened the Series the next day, as Aikens again homered twice and the Royals held on for a 5-3 victory. 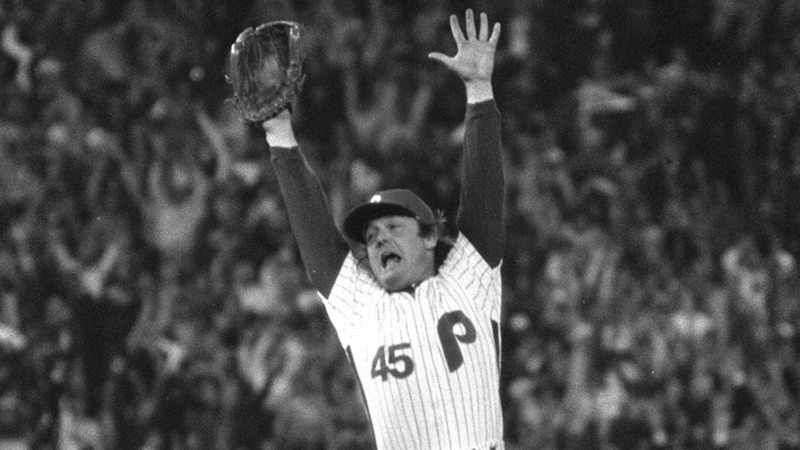 In the pivotal Game 5, the Phillies once again routed Quisenberry, scoring twice in the ninth to take a 4-3 lead, and that's how it ended as Phillies reliever Tug McGraw ended the game by striking out Jose Cardenal with the bases loaded. Game 6 wasn't as close as the others, but there was some late drama. With the Phillies up 4-1 in the ninth, the Royals once again loaded the bases against McGraw ... who, this time, struck out Willie Wilson to end the game and the Series. For the first time in their long history, the Phillies were World Series Champions.